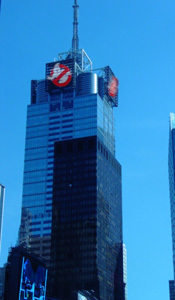 Dr. Ray Stantz leaned back in his chair behind his massive oak desk at Ghostbusters International Headquarters in New York City. He hated the huge office and executive furnishings, Which is why he rarely spent time in the Times Square sky scrapper. He felt more at home in the crowed, cluttered surroundings of the Tribecca Firehouse which has been the home of the Original Ghostbusters office for the last 20 years. Today was something special though, and they needed a lot of room the turnout had been greater then expected. Ray continued to mill through the case file on his laptop. He clicked on the image of a folder with the words “BACCARDIO FILES” written over it. The page switched to a image of handwritten notes from former Ghostbusters-New Jersey CEO, Bill Malkin. “What are we missing? Where does this Baccardio draw his strength from? And where is Mr. Malkin when we need him.” Ray thought out loud. The door to ray’s office swung open and in the doorway stood the GBI Director of Ghostbusting Operations and newly appointed Field Commander of the Baccardio Mission, Rich Roy, in his sleek black special operations tactical flightsuit. Ray and Rich arrived on the dais in the conference room. They glanced out and noticed a few familiar faces sitting in the front row. Dr. William Ketchum from the Maryland Ghostbusters, Dr. Greg Justis from the Detroit Division, Kevin Kemarly of the Onarga Ghostbusters, Dr. Kyle Peterson from North Carolina, and Dr. Andy Harness from Tennessee. Behind them sat some of there staffs and a few others busters from franchises that haven’t been in as close contact with GBI over the last few months. Rich smiled and thought that either they all realized this was a serious and imminent threat to the world or they were seeking some sort of fame and glamour. “What’s bugging ya Bill?” came the voice of Tennesse’s Dr. Andy Harness. “Baccardio, Baccardio bugs me!” replied Bill heroicly. Rich motions for Bill to take the microphone. Bill approached the mic. “Baccardio has made a critical error and the time for our attack is now. We can no longer stand by and let him lead us and grow more powerful. We know that the Four Horsemen are not complete. Death is missing. We can’t wait until he is at full strength with all four of the horsemen by his side. We must strike now!” The crowd swells around Bill’s words. Immediately the hands of Kyle Peterson, Kevin Kemarly, Andy Harness, and Will Ketchum shoot into the air. Bill nods toward them. Then the massive doors swing open and the shadows of 3 men in full ghostbusting gear walk in. The doors shut and cut off the super bright hallway lights. As everyone’s eyes adjust the forms of Dr. Peter Venkman, Dr. Egon Spengler, and Winston Zeddemore emerge. Pangelina pulls her car, a 1993 Mercury Tracer sporting the trademarked green and blue colors of of her original paranormal job with Mystery Incorporated, on to Sandhill Road and stops. Mike nods in acknowledgement. He is busy studying his reports on the slime spray to make sure it is going to work. Pangelina takes a deep breath in through her nose to clear the passage a little. Over the last few days she felt herself starting to get sick and with the lack of flu shots available, she was praying it wasn’t the flu. Mike took notice and reached into his duffle and pulled out a bottle of Vicks Vapor Rub and handed to her. She took a little and rubbed it under her nose and already she could feel relief. Mike slipped the bottle back into his pack. 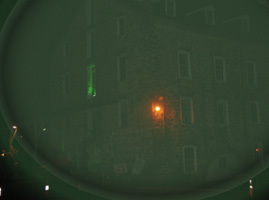 Sickman’s Mill With A Green Force-field? After the almost 3 mile hike to the bottom of Sandhill Rd., Pangelina, Rob, and Mike arrive at Sickman’s Mill. It was kinda hard to miss due to the intense green glowing force-field surrounding the area. Pangelina immediately noticed that the 3rd floor exterior door was open and a pulsating light was emanating from within. As she spoke those words Mike produced the halloween costumes from his bag and began spraying them with the refined Baccardio-Slime solution. He places a black robe with Scream mask to the side for himself, and gives Rob a similar black robe and a rubber skull mask. Then he slyly hands Pangelina the “Miniskirt Witch” costume, which not only contains a very short, very see-through skirt, but a small spider web print tube top. Pangelina looks at the costume then takes Mike’s robe and mask. “Good job Mike, let’s just hope you can find a way to stop it altogether.” replied Pangelina.